I was about to start writing about this newest soup recipe but had to jump up and eat a bowl first—it is that compelling a soup! 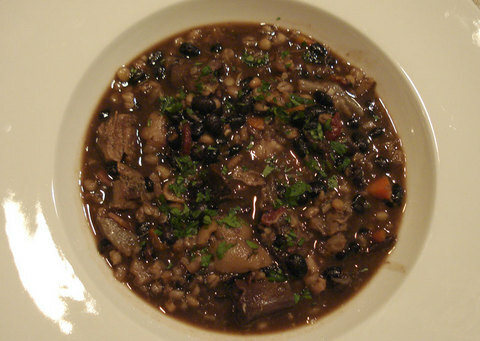 After having fallen in love with the veal shoulder bean and barley soup a few weeks ago I started thinking about bones that have the most gelatin, and pig’s feet have them all beat, though calves' feet trot in as a close second. PIG'S FEET SIMMERING THE CHILLED GELLED STOCK THE GRAND FINALE After simmering the feet for 3 1/2 hours the meat, grizzle, and ligaments were easy to separate from the bones. And there were an astonishing number of little bones. It made me think of a story my mother told me many years ago about her experience in dental school. She recounted that the only difference between premed and predent(al) was when it came to autopsy. The predent students stopped short at the hands and feet. She never understood why but now I do—at least partially. There are more little bones in the feet than in any other part of the body. And I suppose they don’t relate to what is happening in the mouth (except for the metaphor of putting one’s foot in it!). 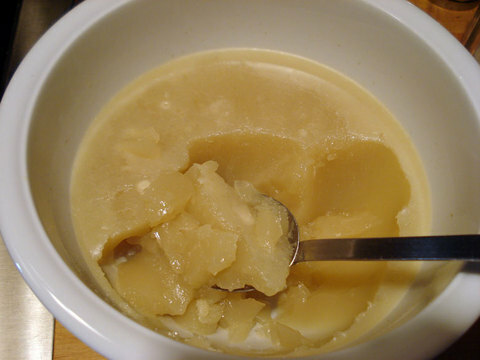 When I was growing up, my grandmother often made calf's foot jelly, called pitcha (which I wouldn’t eat). My Uncle B would walk over for a bowl of it at the shortest notice, he loved it so much. He would eat it still hot and then take back some to eat cold and jelled the next day. Grandma always added vinegar to the boiling feet and after researching pig’s feet I discovered that it wasn’t so much for flavor but rather for health. I wonder if she knew that vinegar leaches the valuable calcium out of the bones and into the stock! My husband suggested I call my version of this dish “Pig Pitcha”! By the way, the secret to keeping the beans (my addition) jet black is to add the water in which they were soaked along with the beans. Actually this soup is surely exceptionally healthful. The pig’s feet have so little fat there was nothing to skim off after chilling. I love the idea of using every part of the animal we eat. This dish is so economical I felt justified in pairing it with a disproportionately expensive pinot or cabernet. Note: If you aren’t home during the day you can either opt to make the soup during the weekend or if you have a crockpot, use it for the long simmering of the bones and do the rest in stages. You can also use the crockpot for the entire soup, keeping in mind that high setting is equal to a simmer on the cooktop and low is about half the heat so takes about double the time. Note: 2 pounds of pigs feet will yield about 14 ounces of edible substance. 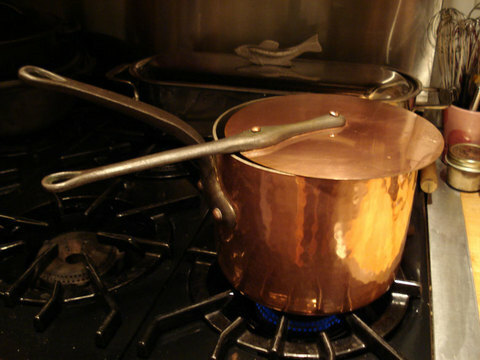 In a heavy deep pot, copper or enameled cast iron, add the 1 quart/4 cups of the water and measure the depth with a metal ruler (that way you’ll know how much to reduce the liquid before adding the beans). Then add the pigs feet and above ingredients. Bring to a boil and simmer for 15 minutes, skimming out any debris. Cover and simmer for 3-1/2 to 4 hours or until falling off the bone. If necessary open the cover a little to keep the liquid from boiling to fast. If necessary, add more boiling water to keep all the ingredients well covered in liquid. Remove the pigs feet and allow them to cool until no longer hot. Meantime strain the stock and discard any solids. At this point you can continue with the recipe or cool the stock by setting the bowl in a larger bowl of ice water and refrigerating it overnight. It will jell completely. When the meat is cool enough to handle, cut the meat, skin, and cartilage from the bone, and return the bones to the stock to continue cooking for as long as possible until ready to finish soup (Anywhere from 5 to 12 hours). Cut the meat and cartilage into small pieces and sprinkle with salt. Refrigerate until shortly before serving. Optional: A few dried porcini mushrooms, 2 slices smoky bacon or 1-1/2 tablespoons extra virgin olive oil, carrots, chopped, 1 medium onion, chopped, 1 stalk celery, chopped, 2 cloves garlic, minced, and a few branches of thyme Also Optional: Fregola (toasted pasta balls): 42 grams/1.5 ounces/1/4 cup salt and pepper to taste a touch of balsamic vinegar to taste, and fresh parsley, chopped. When ready to finish the soup, about 1-1/2 hours before serving, fish out and discard the bones and reduce the broth to 1 quart. Add the beans with their soaking water to the simmering quart of stock (UNsalted) and a few porcini if desired, and simmer for 20 minutes, partially covered. Add the drained barley and simmer 20 minutes. Add the fregola and simmer another 20 minutes. While the beans are simmering, in a large sauté pan, cook the bacon until crisp. Remove, and crumble into medium pieces. Set it aside. Pour off all but 2 tablespoons of the bacon fat (or add olive oil) and sauté the carrots, onion, and celery, sprinkled with a little salt, for about 10 minutes, stirring often, or until the onions are translucent and beginning to brown. Add the garlic and cook, stirring, for 1 minute. Remove the pan from the heat and add the bacon and thyme leaves (strip them from the branches discarding any tough branches). Add this mixture together with the pig’s feet meat after the beans have cooked for a total of 1 hour or when they are tender, and simmer 10 minutes. If further thickness is desired leave the cover off. Alternatively, if too thick, add some boiling water. Taste and adjust the seasonings (salt and pepper). Add balsamic vinegar and Tabasco to taste, starting with just a few dashes. Ladle into bowls and sprinkle a little parsley on top. Inhale deeply, forget about everything else, and settle into the comfort of a nourishing soul-satisfying moment. Update on the New Book!